The BlackHawk Patrol Radio Harness is the ideal companion for easy transport of radios and small life saving components. Great for biking, motorcycling, ski patrol, EMS and any Spec Ops where having a knife, 2nd mag and the easy access to both may be critical. 4-Point Release! 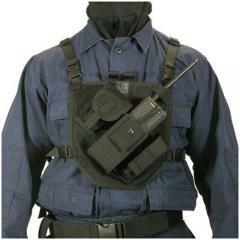 This radio chest harness is made of CoolMax and mesh for comfort. Wt: 14.1 oz.